Using it in calculations can cause performance problems, although its impact is much less with Analysis Services 2008 compared to what it was with 2005. My post on optimising the currency conversion calculations generated by the Add Business Intelligence wizard is a good example of this. It’s not very flexible – it links members on one hierarchy to another hierarchy, whereas what you often want to be able to do (especially if you’re using role-playing dimensions) is to map the currentmember on any hierarchy of a dimension to the currentmember on the equivalent hierarchy on the other dimension. Take the following example. Here’s a very simple cube using the Adventure Works database, with one measure group based on the Internet Sales fact table, one measure called Sales Amount and with three dimensions: Order Date, Due Date and Customer. And from this building a dimension (which I’ve called Date Type) with a single hierarchy, where the IsAggregatable property is set to False. Luckily, in the Internet Sales Fact table there’s a 1:1 relationship between Order Dates and Due Dates, but that’s because the data’s fake. 3) Add a new measure group to the cube based on this fact table (I’ve called it Date Type Switch), add a new role-playing instance of the Date dimension (which I’ve just called Date) to the cube as well as the Date Type dimension created above, and give these dimensions as well as the Order Date and Due Date dimensions regular relationships to this new measure group. 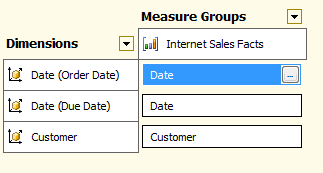 You can then create many-to-many relationships between the Date Type and Date dimensions and the Internet Sales measure group. How does this work, then? You can think of the many-to-many relationship here working like a switch. in most cases when there are two dimensions between the intermediate measure group and the main measure group in a many-to-many relationship, the relationship is resolved through both dimensions. In this case, however, the relationship is only ever resolved through one dimension or the other and the Date Type dimension controls which of the dimensions is used. 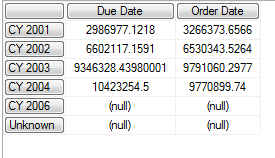 When the Due Date member on Date Type is selected, for example, whatever is selected on the Date dimension is related to the equivalent members on the Due Date dimension while on the Order Date dimension it’s as if you’re not selecting anything (or, strictly speaking, it’s as if you’re selecting all the members on each hierarchy that have data associated with the Due Dates you’ve selected). In this particular case, because there’s a relatively small number of rows in the intermediate measure group, performance is marginally better than the Linkmember approach. However this is not always going to be the case – with a larger intermediate measure group you’ll find performance may be significantly slower than using Linkmember. Therefore, you’ll need to test thoroughly if you do decide to use this approach and your main reason for using it probably should be for the flexibility it provides. Interesting post and very useful one. when “Date Type Switch” measure group processing (select distinct….) on large fact tables. How do you solve this problem? You probably can’t solve it, which is why I said at the end of the post to be careful! Interesting your post but don’t you think Richard Lee post (link below) resolves, more or less, your problem? No, he doesn’t – in this post he (perfectly accurately) describes how the LinkMember function works. The point I’m making here is that you can only use LinkMember when you know in advance which hierarchies are going to be used in your queries; my approach works whatever query you run. As I say, this new approach isn’t appropriate in all cases and if you can use LinkMember it may perform better. I read your blog with great interest and learn a lot. Sorry this question is regarding Linkmember, not your M2M alternative. I’ve recreated your LinkmemberTest cube in AS2005 and these 3 MDX queries but I can’t reconcile the differences. 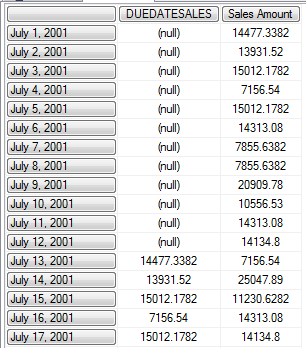 I am assuming that this first query is showing 2005 sales by order week, alongside sales by due week. 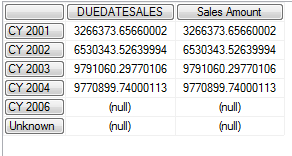 I’ve then split it into two separate queries to show sales by order week, and then sales by due week. Strangely, the numbers in the Due Date query don’t match the Linkmember query. Week 27 and 28 of every year and week 29 of 2005 returns a different result. I assume that this is because the link is failing because the keys don’t match, but that doesn’t explain the week 29 in 2005. I am seeing something similar in a production cube I am trying to report from so I wonder what the issue is, and how I can rectify it. Thanks for the correction, very helpful. Hi Chris, thank you for the post. 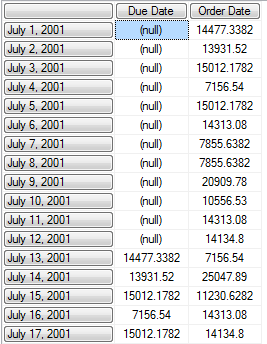 I am working on a banking project and reports typically have several date intersections. This is a very nice alternative to LinkMember and might end up being useful for self-service. Also, thanks for the heads-up on possible performance issues. Most of my roll-ups happen at the month & year level and – so far – performance is snappy. Thanks again! I followed following links to resolve this issue. But don’t know how to apply specify function in Mondrian MDX.